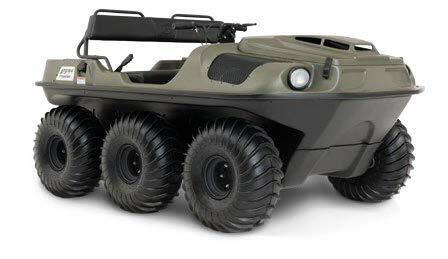 Argo’s base model XTV has been updated this year, adding a full-length skid plate, axle extensions and bilge pump as standard equipment. It comes with a fuel-injected 23 HP Kohler Command Pro V-twin that sends power to all six wheels all the time for maximum off-road traction. Maximum payload for the SE is 640 lbs., towing capacity is 1,200 lbs. and there’s seating for up to four people. This model is available in green or black.